At one point we all find ourselves daydreaming about a nice vacation. Preferably somewhere on an island with a beautiful beach and happy hour that lasts all day. Exploring a new world sometimes seems so out of reach. Stop making excuses because YOU can go on that dream vacation and Funjet can make it possible. 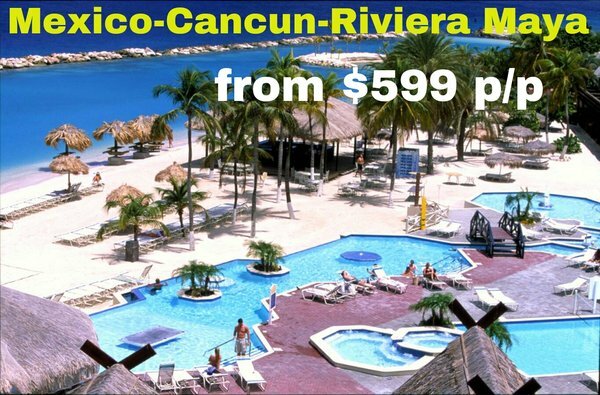 Funjet offers all-inclusive last minute deals to Riviera Maya & Cancun Mexico & other amazing destinations. Book your next all inclusive last minute Cancun and plan your next getaway your way. Funjet has travel deals for all. You don’t have to be rich to travel, Funjet offers all-inclusive deals for any budget. Need a last-minute flight or vacation? Funjet offers last minute ALL INCLUSIVE deals & flights to your destination. We guarantee the cheapest prices & funjet will price match any cheaper offers. Funjet makes it easy, everyone knows that life is better in flipflops. Don’t call it a dream, call it a plan. funjet will take care of the rest because our most important investment is you. Our all-inclusive deals include airfare and hotel stay. Say yes to a new adventure because of all the books in the world the best stories are found between the pages of a passport. Funjet all inclusive to book or call us at 718-833-3500. Click here for more vacation deals from apples travel.